It's been another great season for Peterborough Downtown Farmers' Market, but it all comes to an end for the year on Wednesday (October 3rd). After a successful and fruitful season, the vendors and farmers will be packing up and putting away their tents for another year. 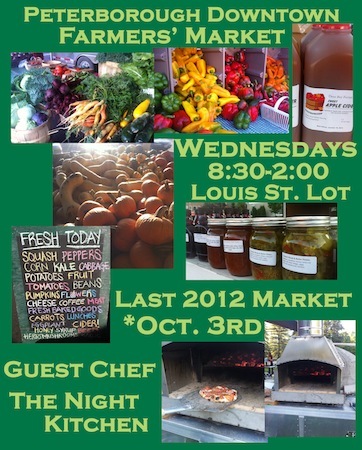 The Night Kitchen will be on hand as the final guest Chef of the season. They will be bringing along their brand new wood fired oven and cooking up samples of their famous pizza using products donated from the market farmers. So hit up the final market for some pizza, to celebrate the harvest, stock up on your fruits and vegetables, take in all the coffee and perogies you can, get recipe ideas, buy some beautiful fall flowers, buy those gifts and crafts you've been eyeing all season, and to say thanks to all the fabulous vendors and farmers.